In this consumption era, many food companies are trying their best to bring a tasty food with the health aspect of it. You can see it from the rice, tea, or other herbal stuff, that’s a good sign that people nowadays start to understand the importance of health or in other words maybe they want to live longer. So if you are fans of a healthy product, then you can try this product, it is the Bigelow green tea. While most of the people start to drink factory production tea, but many companies have started putting too many synthetic sweeteners which make the essential nutritions from the tea are not working. 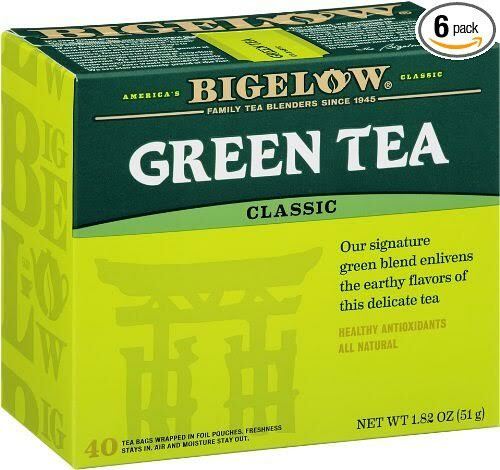 Bigelow green tea is filled with 40 boxes of calorie-free green tea in each of its bags. It can be made hot, or ice depends on your flavor. When we talk about the package, it is made in air tight packets to maintain its freshness. So if you are interested in Bigelow Green Tea, then let’s learn more about it below. The most important aspect in food is maybe its taste; we need to know does this item has an acceptable taste or not. In overall, Bigelow Green Tea is fairly nice; it is packed tightly to maintain its freshness. This freshness is brought forward to its flavor which has contained little freshness in it along with the natural sweet content. The flavor is not that sweet, so if you love a sweet flavor, you can add up some sweetener such as honey, molasses, and maple syrup. Especially for honey, this natural sweetener is the best to be added; it is sweet and also covers the green tea flavor in a positive way. You can count on this product taste, because it has no bitterness at all, even though some of its components are containing caffeine with minimal level. Bigelow Green Tea is a gluten-free, with no calories, and no carbohydrates tea, that’s why you can consider this as an excellent source for your health, it is also an excellent source of healthy antioxidants. While most of its ingredients are a healthy one, but you must note that some contaminant like caffeine are there, other high concentrations of polyphenols is also there. You might also be a little more careful with this product because it can disturb the menstruation process which is the effect caused by the green tea. This effect, though, is somehow debatable because not all the woman customers are having this problem. But, still, it is better to prevent it before happen. Likewise, Bigelow is still one of the best for your health; it can be helpful for the aging process and some diseases such as the cardiovascular disease, irritable bowel disease and controlling cholesterol. Bigelow Green Tea is a product which helps you with many health problems, but you must be cautious for some of its side effects like the menstrual cycle problem. So Bigelow Green Tea is worth to be tried, not only that it tastes good, but it is healthy for you. Check the best price for Bigelow Green Tea here!